In the year 2206, humanity left Earth. At least, some humans did. A selection of our civilization’s best and brightest piled into a great big colony ship bound for the stars—for the brightest star system in Earth’s sky, Sirius. A mere 8.6 light years from Earth, it was essentially like visiting an estranged neighbor. And yet it was a momentous occasion for the self-styled United Federation of Planets, now a burgeoning empire of two worlds. Later, humanity spanning the galaxy, it would be easy to write this first step off as predestined, but the work entailed countless generations. 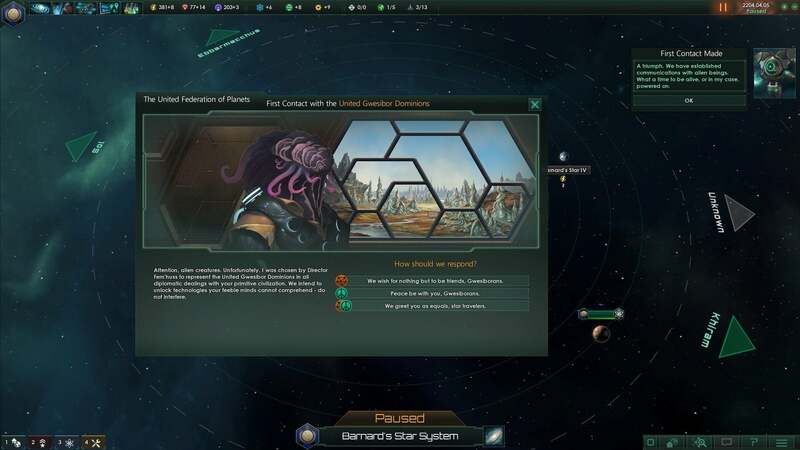 Stellaris is the latest from the grand strategy veterans at Paradox. 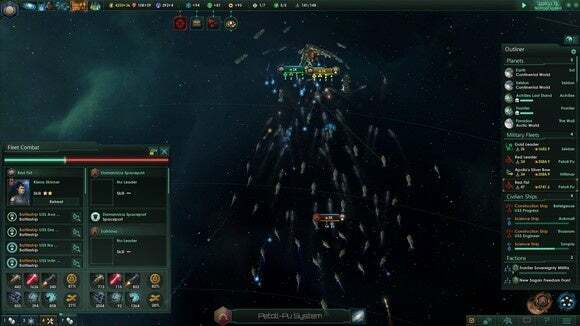 And it's very similar to the studio's previous games—a text-and-number heavy simulation of imperial governance, built on pausable real-time progression and a lot of warfare and diplomacy. 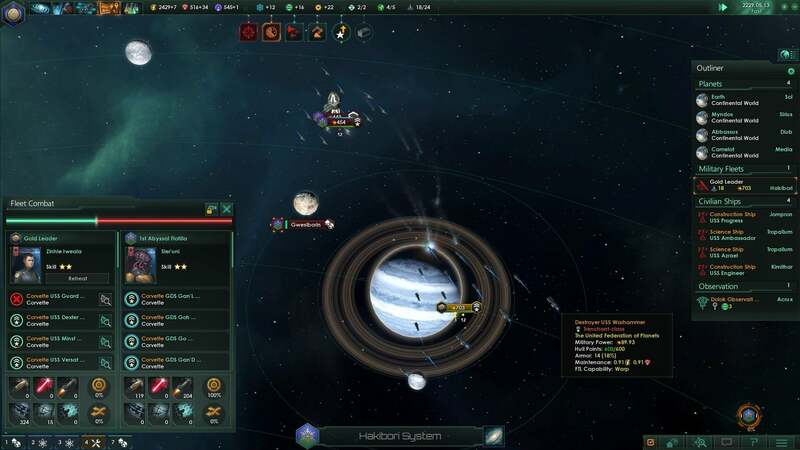 But ditching the stodgy confines of history, Stellaris is the first to take concepts explored in Crusader Kings and Europa Universalis and Hearts of Iron and apply them to something more fantastical—space, the final frontier, the infinite black. The appeal is evident. It’s Star Trek and Battlestar Galactica and Firefly and Farscape and Babylon 5 and Foundation and War of the Worlds and Ringworld and Hyperion and 2001: A Space Odyssey and Dune and The Forever War and A Fire Upon the Deep and Red Dwarf and Solaris and Sunshine and Planet of the Apes and every other damned sci-fi classic you can think of, all brought together into one massive universe. Because that’s the secret: Though to any newcomer the grand strategy genre looks like a wall of information and spreadsheets, armies so many numbers on a map and the constant tick-tick-tick of resource counters, it is in fact a tool for stories. Big, sweeping epics! Tiny interpersonal dramas! The rise and fall of empires! The death of a beloved leader! These are the hooks in any grand strategy game. So goes Stellaris. It’s a loosely-defined sandbox, up-front complexity hiding its emergent-narrative ambitions. Grand strategy doesn’t so much care whether you win or lose. It’s about whether you tried, and what happened when you did try. Maybe you meet a race of benevolent birds, eager to share their research with the galaxy’s newest interstellar travelers. Maybe you come across the gasping remnants of a dying empire, still overwhelmingly powerful even in their death rattle and clinging to the few star systems they possess. Maybe robot workers revolt, tipping over the balance of a delicate singularity and ushering in a new era of machine-led imperialism. Or maybe—just maybe—humanity spreads across the stars, finally putting aside its troubled past and forging out in common interest, arms wide to the universe and all its inhabitants on a mission of peace and insatiable curiosity. The “Not Knowing” is key to Stellaris. I’ve spent plenty of time (perhaps too much time) with Crusader Kings and Europa Universalis and other Paradox titles, but there’s always been a sense of inevitability, of history weighing on your actions. Sure you can send your explorers westward in Europa Universalis to discover the Americas, but you already know America is there. Unbound from reality, Stellaris is free to imagine and explore. Every pop-up box of text reinforces that this is truly the frontier, insofar as any star system you enter could contain a second faction, a pod of space whales, a set of faction-less wildlife sanctuaries for endangered alien life, a civilization taking its first small steps into space or...nothing at all. Sometimes—most times—there’s emptiness. 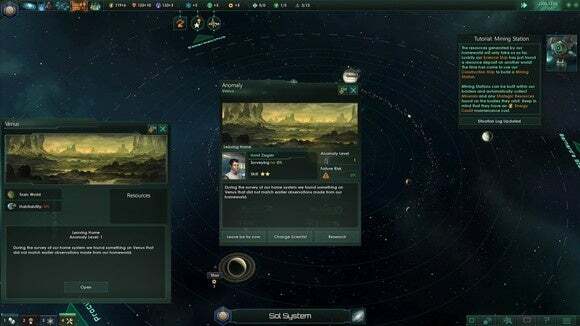 Of course, in Stellaris we know there are others out there. But there’s still a sense of mystery, an urge to explore that simply isn’t present in other Paradox titles. Remember: Grand strategy is about stories. It’s worth noting Stellaris is also much better at presenting those stories (whether playing as humans or some alien civilization) than past games. This is the easiest grand strategy game for anyone new to the genre—primarily because you start small. With Europa Universalis or Crusader Kings, it’s like starting a book by reading the middle chapters. You’re thrown in with no idea what’s happening. "Here, you now rule this massive empire." In Stellaris, you start with a single planet and build up, both physically and conceptually. And you only ever control so many planets at a time—at least, directly. Once you’ve conquered more than five planets you’re urged to dump the rest into sectors, governed semi-autonomously by leaders you appoint. This allows you to expand without micromanaging every system in the galaxy, min-maxing their production and keeping an eye on their needs. 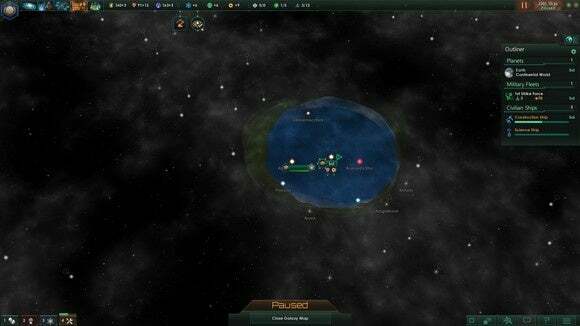 But Stellaris also feels a bit thin, I think. It nails the early period, the sense of exploration and the rush of colonization. It also does a fairly decent job with revamping the later parts of the game, as slow-boiling stories come to a head and the galaxy is cast into crisis. The middle is a bit too much “run-the-game-at-full-speed-for-a-while,” though. As always, I expect Paradox to flesh out Stellaris over the course of years with various expansions—a model familiar to the studio’s fans, by now. And it’s not like the game is too small per se— Stellaris is big enough to sustain you for dozens of hours as-is, and the mod community will undoubtedly do even more to prolong the base game. Still, there are some notable areas in which Stellaris lacks Paradox’s usual depth. Diplomacy is extremely threadbare at the moment, especially for a game that seems set on making peaceful play as interesting as warfare. I’d like to see more nuanced options on immigration, on trade, on alliances—and I’d like to see more truly weird civilizations—the game all-too-often opts for generic, neutral factions. I’d like to see broader Federation tools since something that should be a crowning achievement does little at the moment, and isn’t even reflected on the map in any meaningful way. Nor does it open up any further diplomatic options, like (for instance) sending a representative of another ally to negotiate with factions. Or...well, anything really. Federations are merely fancy alliances with some ship-sharing benefits. I’ve also found leaders to be lackluster. Prime Ministers, for instance, are elected with some sort of mandate—but in my case that mandate was “Build four research stations” nine times out of ten. Success is meagerly rewarded and there's no penalty for failure. Mostly I'd like to see more mid-game surprises and anomalies. Starting a new campaign, seeing all those unnamed specks of light swirling through space, wondering what could possibly be waiting—that’s the best part, right now. The “My god, it’s full of stars” moment. 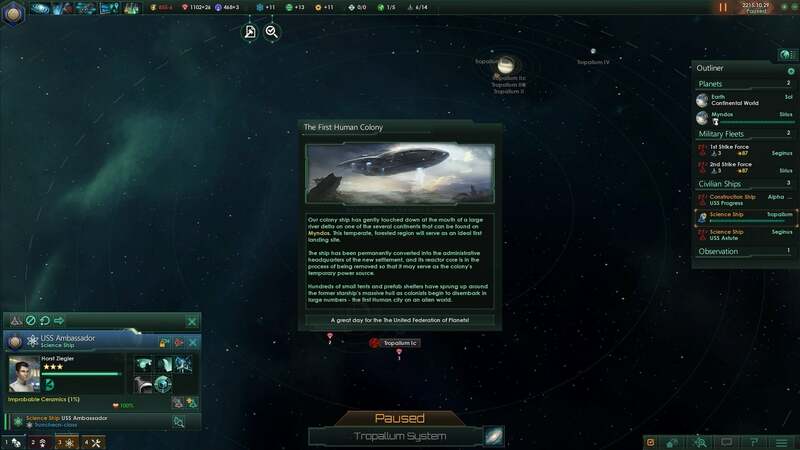 Stellaris just can’t get around the fact that the unknown is often more interesting than the known, and it's compounded by the fact that interesting events peter out in the mid-game. Once you’ve put names to places, once the vast vacuum of the galaxy is filled with artificial borders and the game’s run dry on surprises, it’s a bit tempting to just wipe the slate and start over. See what a new galaxy brings. Again, borrowing from Sagan: “The open road still softly calls.” Thus goes humanity, always in search of a new frontier. Stellaris is great. Maybe not Crusader Kings II great yet—give it a few expansions to fill out—but it’s a compelling bit of player-directed science fiction. Freed from the chains of history Paradox has created something creative and bold and inspiring, something that illuminates just how vast and unknowable space is and how tiny our place in it. Still there’s something reassuring, watching the decades and centuries tick by and the tendrils of civilization creep across the galaxy, thinking “That could be us someday.” Maybe. 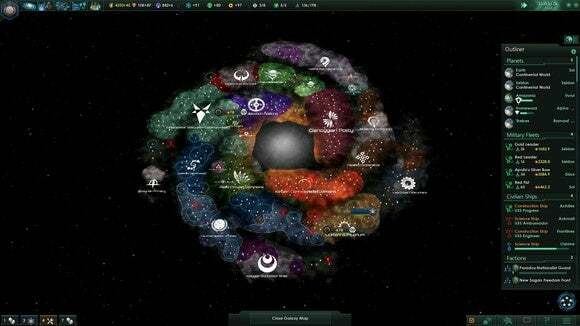 Freed from the chains of history, Paradox takes grand strategy to the stars and creates a solid foundation that's begging to be expanded upon.